Before the Caesars ruled Rome with a series of dynastic emperors, the ancient world’s foremost superpower was a republic ruled by consuls and a small number of large families. From the 3rd to the 1st Centuries B.C., the Roman Republic established itself as THE major power in the Mediterranean with victories over Carthage and the Greek kingdoms. During this time the Romans also put down a slave rebellion led by the gladiator Spartacus. The Republic finally came to an end in 60 BC with the formation of First Triumvirate between Pompey, Julius Caesar and Marcus Licinius Crassus, three military and political leaders whose alliance would end with Caesar declaring himself dictator for life, ending the Republic forever. Now you can get a spectacular Silver Denarius struck during the peak of the Roman Republic’s power between the 3rd and 1st Centuries B.C. This silver denarius was considered to be the most important coin of that era. It circulated heavily throughout the Roman Republic and was used in all forms of payment from shopping in the market to paying soldiers in the service of Rome. Finding one of these coins in nice condition is next to impossible, but fortunately for you we’ve unearthed a small cache of these silver denarius coins that are absolutely magnificent. 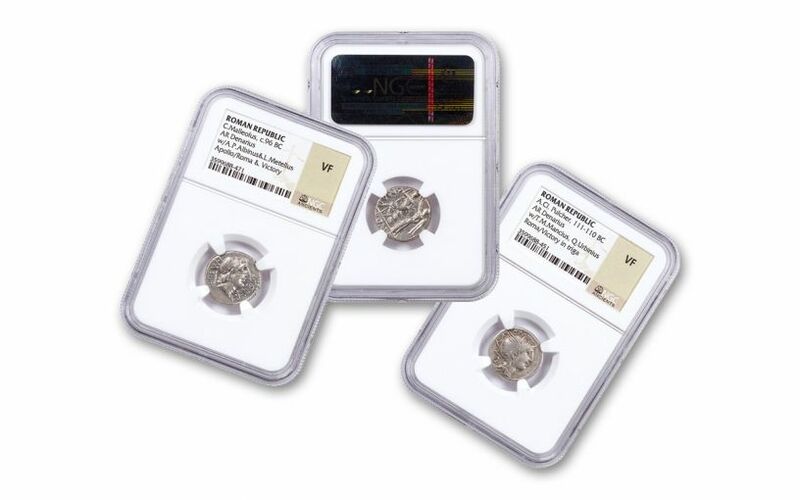 They are so nice, in fact, that each was professionally certified and graded by the Numismatic Guaranty Corporation (NGC) to be in Very Fine (VF) condition! Add this Silver Denarius of the Roman Republic to your cart and become a curator of world history today! Date our choice. IMPORTANT ROMAN COIN – These Silver Denarii struck in era when the Roman Republic reached the height of its power and influence under such military and political leaders Pompey, Caesar and Crassus. 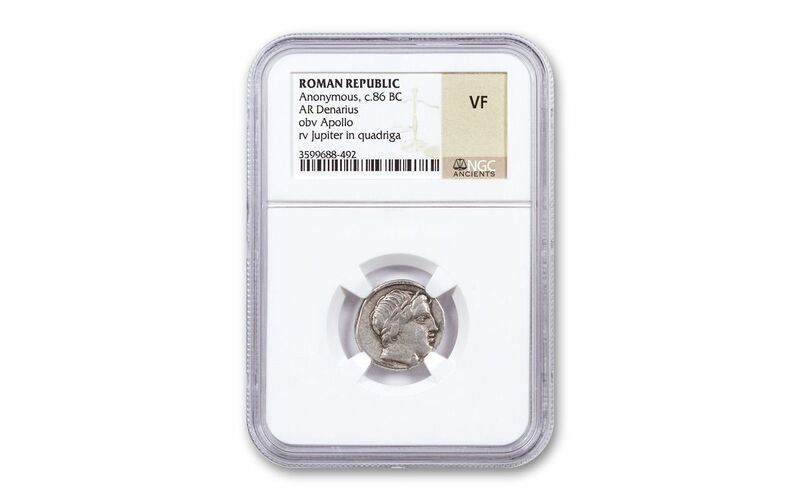 REMARKABLE CONDITION – Your Roman Republic Silver Denarius has been certified and graded by the Numismatic Guaranty Corporation (NGC) to be in Very Fine (VF) condition – a remarkable condition for such a heavily circulated coin struck more than two millennia ago! MUSEUM-QUALITY PIECES OF HISTORY – This coin struck between the 3rd and 1st Centuries B.C. is a true piece of history that you can hold in your hands. Most coins this important and in this nice of condition can be found in museums, but now it can be part of your private collection! 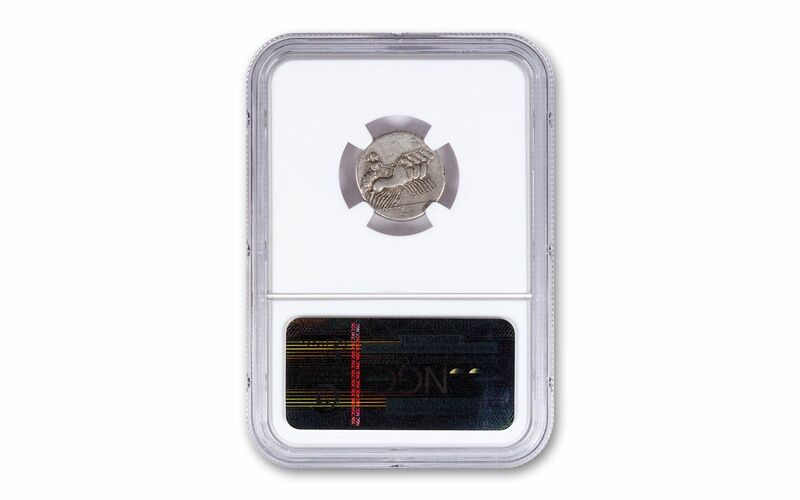 Don’t pass up this chance to own a historic silver Denarius struck during the golden age of the Roman Republic. Secure your ancient coin now while we still have some available.